This Veteran’s Day, take a moment to serve those who serve our country by supporting a local charity like the Red Cross. Service to the Armed Forces is one the organization’s least known services, and yet one of the oldest Red Cross traditions. Everyone knows the Red Cross for large disasters like wildfires and earthquakes, but many may not realize the important role that Red Cross volunteers play every day to support the military. The mission of the Red Cross Service to the Armed Forces program is to provide humanitarian support to military members, veterans, and their families around the clock and around the globe. The Red Cross even provides more blood to veterans than any other organization in the country. Another one of the many services that Red Cross volunteers provide is emergency communications between families and service members. In the last year alone, the Red Cross Central California Region connected 746 local military families to service members through emergency communications. Local Red Cross volunteer and 20 year Navy veteran Logan Weaver knows about these Red Cross services first-hand. When his father had his first heart attack in 2000, Logan was on a Navy ship off the coast of San Diego heading to Hawaii. That’s when he received the official Red Cross emergency message that his father was seriously ill. Within hours, he was on a helicopter headed home to see his dad. That was one of five Red Cross emergency messages Logan would eventually receive over his 20 year career in the US Navy. Now, as a veteran, Logan feels that he has the opportunity to give back to the organization that provided him so much support in his time of need. As an Armed Forces volunteer and Disaster responder, Logan provides moral support for service members returning from or leaving for deployment and helps the Red Cross set up shelters in times of disaster. So this Veteran’s Day, consider supporting a local charity like the Red Cross. 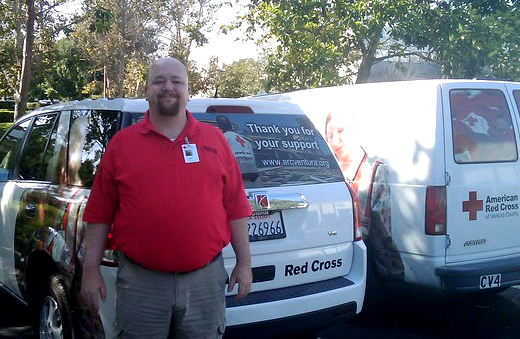 Whether it’s through volunteering like Logan, donating blood, or by giving a financial donation, your generosity allows the Red Cross to provide vital services to service members and their families right here in Central California.